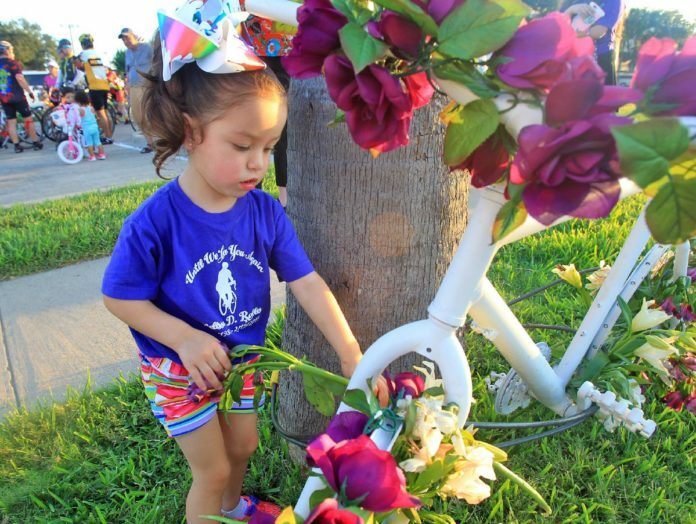 Isabella Robles, 2, places a flower on the ghost bike of her aunt Melissa Robles, who was killed by a driver near Col. Rowe Boulevard and Ridge Road. in February, as riders pause to remember her during the Ride of Silence on Wednesday, May 16, 2018, in McAllen. McALLEN — Two hundred cyclists gathered Wednesday night to ride for Melissa, Eddie and other cyclists who have been killed or injured by drivers on roadways across the Rio Grande Valley, the nation and the world. This year, one cyclist has been killed in the McAllen metro area — 32-year-old Melissa Robles, who was fatally struck from behind by a driver on Feb. 19 as she was riding with her brother on South Second Street. Until then, the area had not lost a cyclist on the road for three years since 38-year-old Eddie Arguelles was fatally hit April 17, 2014, in Edinburg, according to McAllen City Commissioner Veronica Whitacre. How to make that happen, Rodriguez said, is to recognize “sobering facts” about the realities of vehicular traffic. In McAllen alone, there are 8,000 accidents annually that solely involve vehicles, which translates to one accident every hour. “If you understand that you’re introducing yourself into an environment where we’re having accidents at the rate of one an hour … because of that, exercise the greatest safety,” he said. The chief urged cyclists to ride in groups with a vehicle trailing and leading them, and McAllen police officers and Texas Department of Public Safety troopers did just that during Wednesday’s Ride of Silence. The cities of Weslaco, Hidalgo, Brownsville and Harlingen also participated in the national event. Samuel Robles Jr., Melissa’s older brother, said drivers also need to become more aware of others on the road. “People have an aggressive attitude toward driving here … As cycling becomes a bigger and bigger sport and form of exercise here, something needs to change, otherwise (fatal bicycle-vehicle collisions are) going to keep on happening,” Robles said. Wednesday marked the fourth time he has taken his bike on the road since its inaugural ride, which was the morning of his sister’s death. “ It was my sister’s passion, and I was trying to share that with her,” he said of his motivation to start riding. Since then he has ridden in a memorial ride organized on her birthday and in the Shiner GASP, a 100-mile bike ride from Austin to Shiner, Texas, that she had planned to do with her friends, taking her place in the group. While his sister’s death has deterred him from taking to the road as frequently as she loved to do, Robles said he has since become an advocate for cyclists and plans to participate in group rides where extra safety precautions are in place, like the Ride of Silence. “I try to be there the way my sister would be there,” he said.